Nguyen Tien Trung was arrested in July 2009 for alleged links with the banned Democratic Party of Vietnam. In January 2010 he was tried on accusations of "colluding" with Vietnamese activists based abroad to create anti-government websites, post critical articles on the Internet, and incite social instability. According to the indictment, along with Tran Huynh Duy Thuc, Le Cong Dinh and Le Thang Long, Trung had sought to build a multiparty system and written 50 articles posted on the internet. He was sentenced to seven years in prison on charges of attempting to overthrow the government under article 79 of Vietnam's penal code. On April 12, 2014, he was granted early release from prison. 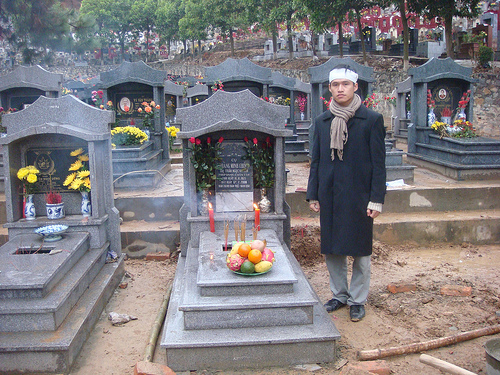 Nguyen Tien Trung at the grave of veteran activist Hoang Minh Chinh after his death in February 2008.